Cyprus Property Blog by Cleo : Fully furnished apartment in Peyia with deeds & sea views! The property features an open plan living area with patio windows leading on to a balcony with spectacular sea and mountain views. Below is the well maintained communal pool with pergola and surrounding gardens. The kitchen is well equipped with built-in oven, electric hob and extractor fan, dishwasher, fridge/freezer, microwave and washing machine. Along the hallway is a good size double size bedroom with fitted wardrobes and shutters, and next to this a shower room with built-in vanity unit and fitted wall unit. 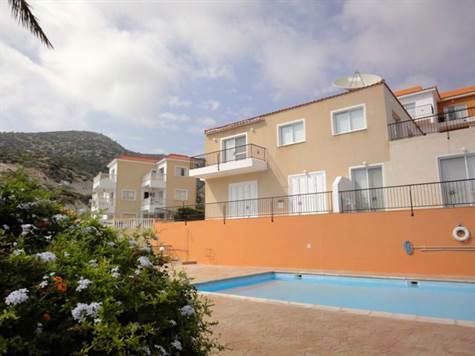 The property is in excellent condition and comes fully furnished. It is ideal for both holiday and residential use and has full title deeds.